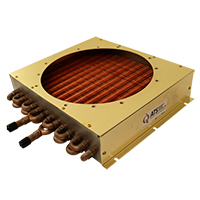 ATS’ tube to fin, liquid-to-air heat exchangers are made with the industry’s highest density fins to maximize the heat transfer from the liquid to air. The heat exchangers fins and tubes are made of copper. Tube diameter: 0.375 and 0.5"